What can the 1985-86 Sydney Morning Herald Good Food Guide tell us about the way culinary culture has changed in Sydney over the last thirty two years? The first thing is the cover. The early Good Food Guides were seemingly very keen on the crest as a graphic device: two lions in a metallic silver finish toasting wine glasses over a plate of lobster, set on an anchor. It has the look of an Australia preoccupied with parodying its increasingly distant anglo inheritance and hamming up the gaudy provincialism of the antipodes, a tradition that is surprisingly resilient in the illusion systems of popular culture today. The bright orange, green and pink cover is a stark contrast to the stylish aesthetic of more recent editions of the guide. It’s a challenge to understand the mindset that informed the design choices without asking the designer and editors. I’m going to assume they were trying to appear jocular and provocative, knowingly poking fun at the performative element of fine dining, the even more gratuitous convention of having to eat at restaurants for a living and the arch persona of the then editor in chief, Leo Schofield. The centrality of the lobster, which readily toggles between luxury and kitsch, certainly suggests this. More recent covers have favoured increasingly high quality photographic images, or bold, minimalist graphics, highlighting the icon of the chefs hat, which, as the recent tagline, “Australia’s home of the hats” indicates, has apparently become core to the mission and values of the publication. 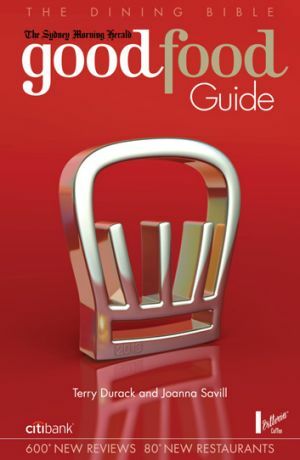 The closest contemporary equivalent to the earlier covers is the 2014 Good Food Guide, which returns to the cartoonish aesthetics of the earlier iterations, albeit in a significantly safer, toned down palette of red, white and black. Looking at the 2013 cover, it doesn’t take long for a design to have the appearance of its times. The bold, shiny, rendered chefs hat, is too much an exercise in displaying the technological capabilities of the software used by the designers, rather than something that understands the technology as a tool in the service of something of greater substance or humour. The next thing is the relative abundance of restaurants with either ‘La’ or ‘Le’ in their title. Of the roughly 250 restaurants reviewed in Sydney, thirteen have names that include French or Italian translations of ‘the’: Le Beach Hut, Le Dodo, La Rustica and La Passion Du Fruit (clearly hamming it up) are my favourites. More recent guides still feature many ‘La’ restaurant names, but ‘Le’ has more or less completely vanished. I can only guess that ‘Le’ has become overly associated with naive appeals to Europe. Current writer for the Good Food, Scott Bolles, points out the prominence of ‘Le’ and ‘La’ titles in his 2014 retrospective, noting that today’s restaurant scene seems more influenced by the US, particularly Los Angeles, than France. About seventy of the total 250ish Sydney restaurants reviewed in the 1985-86 were categorised as French, compared with roughly twenty from a total of 350 in the 2015 guide. The French influence in the 1985-86 guide sees quality expressed through making things into and covering things (usually cuts of meat) in rich sauces, a greater tolerance for and even celebration of stuffing food inside other food (“baked apple filed with prawns and smoked salmon” at Allouche’s in Sylvania is a stand out), and the presence of savoury mousses: perhaps a “charlotte of smoked salmon filled with scallop mousse” at Eliza’s Garden Restaurant in Double Bay, or would you prefer “venison cutlets in an orange, lime and lemon mousse with a sweet and sour sauce” at La Potiniere in McMahons Point? Today the French influence still exists, however, it is more likely to manifest in more rustic, subdued, brasserie style exemplified in dishes like steak-frites. Today’s Good Food Guide plays it safe in comparison to the 1985-86 edition. Perhaps incidents such as the Blue Angel case changed the attitude of food reviewers? Perhaps social expectations have shifted in favour of evaluations that are more generous and less likely to offend? Double Bay locals certainly cop it in the review of Donini’s: “a perfect platform from which to view the passing parade of dowagers, anorexics and fashion victims who constitute a large part of the Bay’s shoppers”. Ouch! Acid opinion still seemingly has its place in other, online media, and recently the new GFG editor Myffy Rigby dished out some refreshingly insightful shaming of insensitive gentrification and juvenile service in this review of Misfits in Redfern. However, it’s unlikely that cruelly stereotyping an entire suburb would make it through the editorial screening process, particularly when a mental illness is mentioned. Schofield provides some very amusing quips throughout the guide. The Lamrock Cafe on Campbell Parade in Bondi, categorised in the now defunct genre of ‘Healthy Food’, receives this rebuke, at which it is difficult not to chuckle: “The menu consists almost entirely of salads, and there’s a vague air of ‘if there’s an avocado in the fridge, there’ll be a meal on the table'”. In the 2016 Good Food Guide there were roughly 350 restaurants reviewed in Sydney, of these only one was situated in Leichhardt (Apertivo) compared with four from a total of 250 in the 1985-86 edition. The decline of the suburb and Norton Street as the focal point for Italian food in Sydney has been covered elsewhere, paid parking and cultural stagnation have been cited as reasons. Suburban Italian restaurants seem to crop up with relative regularity in the 1985 guide. This includes Bar Roma in Parramatta, Enrico’s in Merrylands, Il Buco in Enfield, Campbell’s Coach in Campbelltown, Il Geranio in Nth Strathfield, Il Vico in Top Ryde, La Pentola in Bankstown and Mariu in Petersham (now all permanently closed). While there are Italian restaurants in Linfield, Cronulla, Five Dock and Lane Cove in the 2015 edition, there’s a relative dearth further west. Hard for me to say whether these kinds of restaurants don’t exist anymore or whether they’re just not making the GFG cut. In his review for Manohra Thai in the 1985-86 edition Schofield revealingly remarks, “It’s all very bewildering. Just as we were beginning to order a Chinese meal with confidence, along comes Thailand”. Thai restaurants are now so much part of foodie culture they have become as taken for granted as cafes, pizza restaurants, burger joints and Chinese takeaway. Even the rustics among us can navigate their way to a pad thai, pad see ew or a Thai green curry with urbane effortlessness. 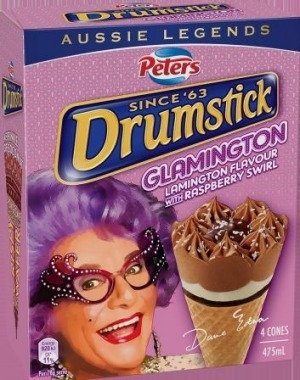 Still a bit suss on those desserts though, better to go get a Gaytime from the servo on the way home. There are a number of categories for cuisine used in the index for the 1985-86 guide that are amusingly anachronistic. These include: Jewish, International, Eclectic, Healthy Food, Anglo-Saxon and Individual. ‘Jewish’ cuisine is now more accurately distributed according to the range of nations which have been home to the Jewish diaspora throughout history. ‘Anglo-Saxon’ has been replaced by the less antiquated ‘British’. ‘Healthy Food’ now lacks the novelty and the identity to form a category of its own in the guide. With an increasing preference for regional specificity within nationalities, ‘International’ is right off trend. ‘Eclectic’ and ‘Individual’ have been absorbed in the presently bulging category of ‘Contemporary’. The avocado is currently a symbol for missspent youth, typically taking the more rustic, smashed form, eaten at breakfast or brunch. In 1985-86 it was more common to see the fruit served for dinner in high-end restaurants. At La Grillade in Crows Nest there was “St Pierre avec avocado” and at Edna’s table the derided “avocado and cheese tart”, which is described as “a kind of guacomole with a halo of mung bean and red capsicum salad”. – Cappuccino was the coffee by which restaurants were judged (“Desserts and cappuccino [at Clareville Kiosk] are first class”) and there was even a cafe with the quaintly retro sounding name Cappuccino City on Oxford Street in Paddington. – There used to be two Laurie’s Vegetarians (now on Bondi Road): one in Darlinghurst on the corner of Burton and Victoria streets and one near Central Station–who knew! – There used to be a Lentil as Anything in Manly?! In 1985?! – Peter’s of Kensington is in there for “salads, quiches, fabulous chocolates”?! – Still kickin’ (some in different iterations, some more or less unchanged): Badde Manors, Beppi’s, Berowra Waters Inn, Bill and Toni’s The Dolphin Hotel, Laurie’s Vegetarian, Lucios, Jonahs, Clareville Kiosk, Unas…(there are probably others I have missed). And to sum things up, the scallops mango, from Le Beach Hut in Dolls Point: “scallops served in half a mango with ginger and sour cream sauce”. At the south western end of Prince Alfred Park the canopies of two large Moreton Bay Figs entangle to enclose a flat, grassy area, with the sandstone remains of some prior vision for the place, including steps and two sandstone retaining walls. The area in-between the two walls, under the shade of the figs, is a flat, roughly square patch of grass, levelled into the slope, bordered by taller, thicker tufts of kangaroo grass and Dianella . I have admired this space from the vantage of the nearby outdoor exercise gym for some time. It is a quasi-inside space, with the trees providing a roof and walls of sorts, and the flat, landscaped ground and sandstone elements further adding to the sense of a welcoming enclosure. In the summer of this year I surrendered to the urge to breakfast under the trees on my way to work. It is now almost an everyday occurrence. Between 8-9am a man shovelling his oats, yoghurt and fruit from a plastic container is now part of the park mise en scène, along with increasingly diverse acrobatics performed by those hooked on the morning endorphins or calm that comes from deploying the body in states of controlled motion and resistance on the fitness gym nearby. Recently, I have noticed other people inhabiting the space. Sometimes someone will be sunning themselves, leaning back against one of the large buttress roots of the figs. For a while a tent was pitched in the space. I could see the integrated feet of a couple through the gauze of the open flap. The desire to document the diverse uses to which the space is put led me to approaching another couple who I have seen on a number of occasions canoodling between the buttress roots on what I presume is their lunch break. I felt conflicted by ruining their sense of privacy and my own desire to observe and share thoughts about the space. My request for a photo was turned down. More so than other, common Sydney trees, such as plane trees, brush box and various eucalypts, the Moreton Bay fig makes a show of its roots. Combined with the large, spreading branches, which often come close to touching the ground, all parts of the tree seem involved in the sinewy display of unity and differentiation that the German philosopher Sloterdijk identifies as one of the key metaphorical attributes of trees. The bulky, deep cavities of it’s buttress roots are one of the tree’s distinctive features. The these give the tree an architectural dimension reminiscent of grand, cavernous cathedrals. The Australian poet Robert Gary recognises this in his poem “Smoke” when he describes the tree as possessing a “Gaudi-like, visceral architecture” (cited in Hart, 166). The spatial imagination of trees and vegetative life is a constant presence both in contemporary popular culture and ancient systems of human knowledge. Trees give tangible form to the integration of the contrasting forces of unity and differentiation which are central to earthly systems of life support and communication. Examples abound: the Winterfell heart tree in Game of Thrones, the sprawling, towering, viral vegetative network of the second series of Stranger Things, the role the tree played as a meme in the field of organic chemistry in 19th and early 20th centuries trees, and many variations on trees of life and trees of knowledge in ancient religious texts. Climbing trees and building tree houses are common, fondly remembered childhood activities. Without houses of their own, children make use of their imagination and turn trees into places of play and dwelling. Finding good climbing tree or tree for a tree house still figures in the perceptual experience of adults who carry the residual memories of their arboreal childhood adventures and rudimentary homebuilding in the branches. The magic and grandeur of a particular Moreton Bay Fig seems to have been one of the key pieces of inspiration for Judy Bernard-Waite’s children’s book, The Riddle of the Trumpalar (1981). The fig in question can be found in the bushland that rises up behind Trumpar Park Oval in Paddington. It is easy to see why this giant specimen would have provoked a fantasy of mystical beings and imaginary lands accessible only to those with active imaginations. The Riddle of the Trumpalar is based around the efforts of two children to protect the particular Moreton Bay from the council, who plan to cut it down. The hidden value of trees, to adults and children, becomes manifest when the threat of disappearance becomes a reality. Unlike houses, which convey their amenity in a more obvious fashion, the ambiguous status of trees as spaces of dwelling for humans and animals often leads to conflict and public outcry. This was the case in the summer of 2015-16 when the Port Jackson Figs along the south western fringe of Centennial Park were removed to make way for the new light rail. Residents and campaigners dressed in mourning attire protested on Alison Road with placards speaking on behalf of the trees. Poems that were originally written to commemorate the dead soldiers for whom some of the trees were originally planted were re-appropriated and used in banners of protest. The German philosopher Peter Sloterdjik devotes a significant section to trees in Bubbles: Spheres Volume I, his sweeping, anthropological analysis of intimate psychological spaces. In an interview about the book, Sloterdijk points to the intimacy people feel towards trees: “People do not only identify with animals they also have brotherly and sisterly feelings toward plants. Trees are, as it were, the first plants to which you can really relate to. There’s an affinity that probably has something to do with this spherical form of the tree”. Sloterdijk speculates about the metaphorical correlations which underpin the widely known desires people have to hug, plant, picnic and live in the proximity of trees. Sloterdijk sees this example as lending credence to his argument that there is a deep psychological connectedness between humans and trees. He describes the Buzancy tree as a “herbaceous magnetisation machine” that plays the role of a “metaphorical umbilical cord” connecting the individuals in a psychophysical companionship, reminiscent of the relationship infants have with their mothers (Sloterdijk 2011, 409). “Puységur and the magnetised elm of Buzancy”, from the third edition of Puységur’s Memoirs…du magnitisme animal. The concept of ecosystems services helps to make explicit the value of trees by using the language and metrics that are palatable in positivist cultures. Scientists can speak persuasively on behalf of trees when they provide data that proves trees play a role in the reduction of pollution, temperature control and carbon sequestration. However, as demonstrated by researchers at the University of Melbourne and The ANU, trees also provide important psychological and emotional companionship to humans, which escapes the typical measures used to assess benefit. Part of the research involves an email service that allows people to communicate with specific trees. Many of the emails show strong emotional connections, with responses such as: “I very fond of you [sic]”, “I miss you”, “It makes me happy knowing you are there”, and “It saddens me that your passing will be sooner than my own”. Interestingly, it was a certain golden elm tree on Punt Road in Melbourne which received the most emails. The legend Buzany elm lives on in the digital age! Comparable research conducted by researchers at the Fenner School at ANU used a photo elicitation exercise to collect feedback from farmers in rural NSW about why they valued trees. The research participants were asked to photograph “significant features of their farm landscape, especially those that influenced their farm management decisions, and record what they captured and why” (Sherren, Fischer and Price 2010, 1058). The design of the research allowed for explication of aesthetic and emotional dimensions between farmers and trees, which might otherwise remain inexplicit. The written responses of the farmers indicate a nuanced relationship between the specific forms of trees and the feelings they provoke, with descriptions such as “gnarly”, and “scraggly” accompanying aesthetic evaluations including “beautiful”, ”funny”, and “interesting” (1060). The picturesque tradition in painting and gardening has long recognised the importance of well placed trees as framing devices for landscape or landscape features. Trees can add a vertical dimension that works in contrast and harmony with the horizon. Not unlike the spire of a church, they act as mediators between the heavens and the earth, screening light into tangible form. The lone trees that often frame the foreground of picturesque paintings seem to dwell in the middle ground between the undifferentiated mass of a forest and the more ordered, civilising forces of human activity and structure. The Cornfield, John Constable, 1826, The National Gallery London. However, the perspectival conventions of this tradition are only one, initial step in understanding of the dynamic spatio-psychological relationship that exists between humans and trees. In looking at a picturesque painting of Claude Lorrain or John Constable, for example, the viewer gains little sense of the dynamism and complexity that exists when we come to be inside something and of the role trees have played in the biological, emotional and intellectual evolution of humanity. The Belgian surrealist painter Rene Magritte was a lover of trees. Magritte saw the trees as an “image of certain happiness”, which bear witness to the “more or less agitated spectacle of our life.” Magritte’s love of trees is perhaps most directly displayed in his series of paintings, The Voice of Blood, which add a further layer of understanding to the companionship shared between humans and trees. Sloterdijk interprets this series as an exemplification of the vegetative nature which supports “intellectual inhabitants” (373), describing Magritte’s trees as a ”detailed, spongy spheric structure” reminiscent of a womb. If the viewer puts themselves in the position of an foetus, experiencing their first audible sensations, this is something the title of the painting would also seem to suggest. La voix du sang (Voice of Blood), René Magritte, 1959. The most obviously distinctive element of the tree in this series of paintings is the sphere and the house which are contained in its trunk. The house and sphere are revealed behind two, vertically arranged doors that swing open in opposite directions. Sloterdijk notes “the humanly significant contrast […] between the organic form represented by the branches and leaves and the intellectually idealised and constructed figures of the house and ball” (370-373). According to Sloterdijk’s interpretation, Magritte’s tree is “pregnant […] with human subjectivity” (373) due to the presence of these anthropologically significant forms. The presence of the “geometric foetuses” in the trunk of the tree and its “nourishing foliar sphere” suggest a metaphorical connectedness to the tree of knowledge and the tree of life, which as Sloterdijk notes in his earlier analysis, are symbolically significant thought forms throughout human history. Magritte saw the essence of a tree as something that is best captured when we are static, remarking that when humans move it is the tree who sees us, as it becomes witness to our activity rather than us to its. There are hints of an appreciation for one of the broader insights of relativity theory in this understanding: perception and temporality are the consequence of different, continuously changing event structures. Yet Magritte’s works to a certain extent remain limited by his surrealist emphasis on symbolic association and don’t seem to fully express the consequences of this understanding of time and perception . William Robinson’s landscapes paintings of the forests of Beechmont in the Gold Coast hinterland suggest a more fully realised application of a relativistic understanding of perception in the medium of painting. Robinson’s distinctive contribution to the genre of landscape painting is arguably in the way his works—such as “Afternoon Light at Springbrook” (2001), the “Tone Poem” series (2007-2008), and “Springbrook with lifting fog” (1999)—eschew the typical perspectival devices of representative landscape painting and offer an alternative spatial model of a landscape that manages to incorporate both inside and outside perspectives on a single surface. His works hint at what’s possible with regard to making explicit the hidden architectural relations humans have with trees. Afternoon Light at Springbrook, William Robinson, 2001. In her dissertation on mathematics and art (2009) Janelle Robyn Humphreys uses the paradigmatic topological figure of the Möbius strip to interpret the twisting coherence at work in Robinson’s paintings (23-47). As she notes, “There is no single viewpoint from which to observe his landscapes as is often the case in landscape paintings based on linear perspective. The multiple or shifting viewpoints give a sense of topography that is twisting and turning, like the rotating earth” (29). In this sense, Robinson’s paintings are a kind of “geometry given body by motion”—an irresistible phrase of Steven Connor’s to describe the topological thought at work in the philosophy of Michel Serres (2004). His works express the encounter between humans and trees as a dynamically unfolding perceptual event over time. The sense his works give of multiple, differentiated perspectives, combining together in a united whole is reminiscent of combination of unity and differentiation which Sloterdijk identifies as a key metaphorical affordance of the tree thought form. The two Moreton Bay figs which enclose the terraced grass patch on the south western fringe of Prince Alfred Park were most likely planted in 1870. They are part of a border planting which conforms to the original designs of Benjamin Backhouse, whose plan saw the transformation of a paddock-like landscape into a Victorian era park, fit for the new Exhibition Building, the foundation stone of which was laid in the same year. While old by human standards, these trees have been witness to a relative small but changeful period of history associated with white settlement. Like many landscapes in Sydney, the landscape design interventions of Backhouse came after a denuding of the original landscape. John Rae’s 1850s painting of the Cleveland Paddocks (as Prince Alfred Park was known to white settlers prior to 1868) shows a bare landscape, crowded with settlers and their horses, dogs and cattle. A small group of what appear to be aboriginal Australians in European clothing sit on the ground in a circle off to the right of the picture. They are seemingly marked out from other people in the painting due to their seated position, backs turned away from the view north, towards the city and harbour, which is admired by the rest of the crowd. Unlike the other people in the picture, who seem at home in the outdoor activities of recreation and spectacle, this small gathering seem like inhabitants who are profoundly at odds with the new logic of dwelling, labour and play that has seen their country changed beyond recognition. As Don Watson has so compellingly shown in his cultural history of the Australian environment, The Bush (2014), white settlement in this country is in significant part a history of acute intervention into the landscape—’landscape’ is itself a word which denotes a certain, thin, two dimensionality, associated with traditions of aesthetic representation and design for visual improvement. It is impossible for white settlers to adequately imagine and experience the architectural affordances and symbolic systems of life support the treed environments would have offered to the peoples who inhabited this country for so long prior to the colonial project. It is impossible for white settlers to adequately imagine and experience the architectural affordances and symbolic systems of life support the treed environments would have offered to the peoples who inhabited this country for so long prior to the colonial project. However, if the vocabulary and syntax of Bill Neidjie is any indication, the relationship between Aboriginal Australians and their arboreal companions was informed by an understanding that humans and trees are connected intimately through feeling. Neidjie was a Gaagudju man, and the last surviving speaker of the Gaagudju language. His book, Story About Feeling, is the transcription of talks between Neidjie and Keith Taylor in 1982, which to western eyes reads as a combination of narrative, poetry and metaphysics. One chapter is devoted to trees. Neidgie writes, “That tree e listen to you, what you!/ E got no finger, e can’t speak/ but that leaf e pumping his./ Way e grow in the night while you sleeping…/ you dream something,/ that tree and grass same thing…/ e grow with your body, your feeling” (23). This fragment of Neidgie’s work seems to suggest that in the dormitory condition in particular it becomes explicit that humans and trees participate in a shared activity, as though in sleep our nutritive souls are expressed. It would be tendencious for this author to speculate about the extent to which Neidjie’s language and philosophy was widely shared across Aboriginal nations. However, set alongside what we know about how the landscape in Australia prior to white settlement, it is clear that the first peoples of this country had a mythically rich, benevolent and sustainable relationship with trees. What are the different ways in which humans come to possess a place? I wonder about the constraints that the form of knowledge associated with real estate and all its attendant concepts enforce upon thinking about places. As my trips to the place underneath the fig canopy in Prince Alfred Park become more frequent, the range of activities I undertake there become more varied and bold. Is the latent inside-ness of the place becoming explicit as I stretch shirtless under its branches, as I make it the place where an increasingly large number of my thoughts emerge and become articulated? Will the couples embracing, smoking, walking their dogs and sun baking under its branches become attached to the place as their life takes form here? Will a certain mood, a restlessness, compel them to come back, many years on from now, and place their hands on Moreton for the consultation offered by the tree? Bernard-Waite, Judy, The riddle of the Trumpalar, Gosford, N.S.W. : Ashton Scholastic, 1981. Ellenberger, Henri F. (1970), The Discovery of the Unconscious: The History and Evolution of Dynamic Psychiatry. New York: Basic Books, 1970. Hart, Kevin., Poetry and Revelation: For a Phenomenology of Religious Poetry, London: Bloomsbury, 2017. Kendal, D. Wilson, A. and Pearce, L. “Loving emails show there’s more to trees than ecosystem services”, The Conversation, July 24, 2015. Humphreys, J. R. “Shadows of another dimension: A bridge between mathematician and artist”, PhD Dissertation, University of Wollongong, Faculty of Creative Arts, School of Art and Design, 2009. Neidjie, Bill. Story About Feeling. Keith Taylor (ed),Broome: Magabala Books, 1989. Sherren, K., Fischera, J., Price, R. “Using photography to elicit grazier values and management practices relating to tree survival and recruitment”, Land Use Policy 27 (2010) 1056–1067. Sloterdijk, Peter., Spheres, Volume 1: Bubbles: Microspherology. Trans. Wieland Hoban. Los Angeles: Semiotext(e), 2011. Sloterdijk, Peter. “Satan at the Center and Double Rhizomes: Discussing ‘Spheres’ and beyond with Peter Sloterdijk”, interviewed by Tom Boellstorff, LA Review of Books, 2014. Accessed June 27, 2016, https://lareviewofbooks.org/article/satan-center-double- rhizomes-discussing-spheres-beyond-peter-sloterdijk/ – ! Watson, Don. The Bush. Sydney: Penguin Group, 2014.